When you commission a piece of Mokuzai Furniture, what you receive is not just a beautiful table, or bench or cabinet. Each piece of Mokuzai Furniture is a finely detailed work of functional art. When you commission a piece of Mokuzai Furniture, what you receive is not just a beautiful table, or bench or cabinet. What you are getting is not just furniture. It is not just a collection of legs and tops, sides and seats. Each piece of Mokuzai Furniture is a finely detailed work of functional art. Let me show you a little about what makes that difference! If you look more closely, you will find a carefully planned canvas. With the unique grain patterns of the wood, an artistic composition is created. It all starts with rough lumber. Cut from the trunk of a tree, the naturally occurring patterns in the wood are created by the way the tree grows. The species of tree lays the ground work for those patterns but then the sun, the wind, the rain and temperature all help to shape the internal beauty of the tree. From the rough lumber, with an artistic eye, those grain patterns are thoughtfully designed. With unique markings, the initial design layout begins. Patterns are matched and the special details in the wood are chosen for highlighted positions on the final piece. 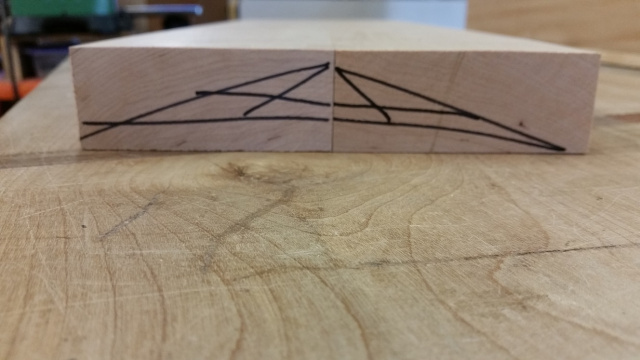 Here, a set of table legs are marked. These markings will ensure that the set is properly arranged on the table for mirroring and matching. This will be display shelving on a sofa table. 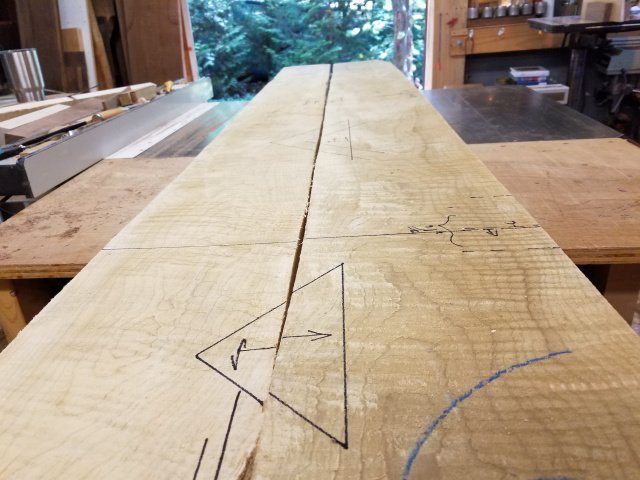 The tiger maple is lined up just right so that the grain patterns come together seamlessly when the boards are connected as one. But to most people, that doesn't look like much, right? Well, I agree! I am still amazed at how much Peyton can see at this point in the process. For most of us it's just lumber. From all my experience in selecting the lumber, I can see the difference between what is high quality material and what is not, but to see how the details in particular pieces of wood are going to become that amazing finished table, now that is still beyond me. This is where I see the difference lies between an artist and simply a furniture maker. Peyton doesn't just see how the wood can be cut and measured and put together for a great piece of furniture. He sees something deeper. He sees how the story of the growing tree is going to artfully dance across the canvas of each table, bench or cabinet. Look closely at this walnut console table. The first thing that stood out to me was the half moon arches in the table legs. If you were to see the entire table here, you would find that both legs are mirror images. That fact alone is beautiful, that this really lovely grain pattern was selected for the upper portion of the table leg and then it was exactly mirrored on the other side of the table for artistic balance. "Amazing! ", you say, but that's not the end of the story. ...and now you are blown away. Another artistic touch you will find in Mokuzai Furniture is the way the grain patterns are designed to wrap around a piece. In this walnut bar cabinet, you can see how the grain patterns flow up and over from the side panel across the top. On this cherry end table, the patterns wrap around the table aprons for what becomes are nearly complete circle. And it's not just the outside, most visible part of a piece that is artistically designed. Here, you see the interiors of the drawers for an entry console table. The dark walnut contrasts so beautifully with the lighter tiger maple. You can see that no detail was left undone. These drawer bottoms were probably my favorite part of the entire piece. Not only were they cut from a particularly awesome piece of walnut, but look at how those patterns all come together across the three drawers. The easy choice would have been to use matched pieces and line them up exactly the same way in each drawer. Well that's not the easy choice because he didn't just use a piece of scrap plywood, but on our level, the three matched bottoms arranged exactly the same way would have been easy. Instead, Peyton manipulated the arrangement so that each corner that met the next drawer created a unique spray of pattern. I think whether or not to ever store something in them and then actually close the drawers may have been a very difficult decision for this customer. I could put in the hours of practice, be trained by the best, read all the materials on technique and with high quality materials, get to a point that I could build some really nice furniture. There are a ton of people out there doing it, and even doing it successfully, but most are just building furniture. To be able to build more than just a table, just a bench or just a cabinet, I think it's something you have or your don't, and I think Peyton has it. Peyton White is an artist. In an artist, there is something more than just good technique and learned skill. In an artist there is a heart and voice that finds expression through tangible materials. There is a keen eye of understanding, of seeing all that can be and the way to make that happen. So when you receive a piece of Mokuzai Furniture, know that it's not just furniture. It is a one of a kind, thoughtfully composed, handmade expression of artistic beauty and talent, that will serve your home and family in the function of everyday, and serve the soul, in connecting the beauty of nature with life.